Earlier today, we tried out one of Full Sail's core brews: their IPA. Now, it's time for another of those core brews, the Pale Ale. They're pretty proud of this one, describing it on their site as "the godlike nectar that is our Pale Ale." They also play up the concept of balance, which bodes well for the liquid in the bottle. Full Sail keeps the the hop bill a secret for some reason, but does mention the malt bill consists of Two-Row Pale and Crystal. Anyway, here's how they describe the resulting brew. Our Pale Ale has a fresh, hoppy aroma that comes from two (top secret) Northwest hop varieties, while two-row Pale and Crystal malt give it a mild sweetness that finishes clean and crisp. Well, let's see if it's truly godlike, or a little more agnostic. Appearance: A crystal-clear, golden-amber body with a finger of off-white head that features decent retention and lacing. Aroma: Spicy, herbal, and nicely citrusy hops over toasty malt. The hops definitely have Pacific Northwest character. Taste: It follows the aroma perfectly. Those citrusy and herbal Pacific NW hops on top of toasted caramel malt. The malt backbone is more than strong enough to match the hops, making it a balanced proposition. An herbal and toasty aftertaste. Mouthfeel: Medium-light bodied with good carbonation and a dry finish. Drinkability: With mild flavor, alcohol and mouthfeel, this is rather sessionable. 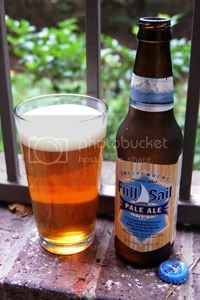 Verdict: While Full Sail Pale Ale may not be the most exciting Pale on the shelves, it certainly works. Overall, this seems like a nice combination of an English Pale Ale with a good dash of Pacific Northwest hop character thrown in.